Marinate these Cornish game hens overnight then put them on the grill and you will have the best game hens you've ever tried. You can even place them on a rotisserie over the grill. Split Cornish game hens lengthwise. Rinse hen halves; pat dry with paper towel. For marinade, in a medium plastic or glass bowl combine all remaining ingredients, except rosemary. Divide marinade in half, reserving half of the mixture to baste hens during the cooking process. Place hens in a large plastic bag. Pour half of the marinade over the hens. Release excess air from bag and seal. Place into refrigerator and allow hens to marinate for 3 to 8 hours. Preheat grill. Just before grilling, add rosemary sprigs to the coals or place in a smoker box. Remove hens from marinade and place, skin side up, on grill rack. Discard marinade. Cover grill and cook for 45 minutes or until hens test done (an internal temperature of 165 degrees F), basting with reserved half of marinade for the first 30 to 35 minutes of cook time. 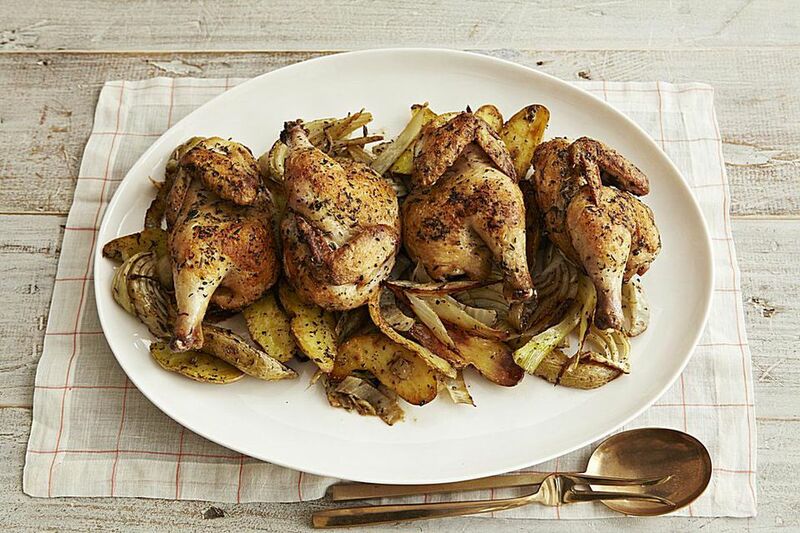 Once hens are cooked through, remove from heat and serve with your favorite sides.